GTR 23.com. Twenty Three. Two in Japanese is Ni , three in Japanese is San. GTR 23 IS LIVE ! 23 is the most famous number used for the race cars for many years in Lemans, Super GT and other Racing series. Lucky Number ! Bought to you by the people at GTC, we introduce the very best stand alone website for GT-R performance parts. In Partnership / association with Super Brands Sunline Auto, Auto Select, Power House Amuse, Zele Harrison, Cobb Tuning, Midori, HKS Kansai, Blitz, Endless brake technology, 5Zigen, Top Secret and many others who support & work with us. First in Europe to test on the dyno, and surprise surprise we found Nissan had in fact underestimated power figures, we saw 502 bhp, which is 22bhp over factory claimed 480 BHP. We also saw an even more impressive 520bhp using BP Ultimate 102 Unleaded. First to add an aftermarket exhaust and not just any run of the mill exhaust, we insisted on the very best Sunline Auto GT Titanium, this saw a fantastic response of 30bhp extra with just cat back exhaust and front pipe…and a sweet sound that is unique to Japanese Titanium, increasing the stock 88db to 98 db. For over 6 years GTC has been providing a highly competitive service that enables our customers to source amazing tuning parts from USA and Japan. Our friendly and efficient service is aimed at providing complete customer satisfaction and most of our business comes by word of mouth through previous customers. Please browse our site and find out what we are able to offer you. If you don´t see what you want, or if you have any questions, please contact us. Whatever your requirements, you’re in safe, experienced hands. As well as being Europe’s premier performance parts distributor, we can offer technical advise and servicing on your GT-R. 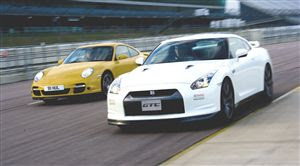 Forget hearsay on the net, we know which oils should be used on the increadible GT-R gear box, engine and LSD. We have fault finding and error codes clearing diagnostic equipment. We can reflash your ecu for different levels of tune (further details can be found on our tuning page). More sources for Japanese and other parts overseas.